Jeremy Lin is officially sharing his prayers with fans, months after starting a prayer group. Lin, the 26-year-old Los Angeles Lakers guard, sent an official email to those subscribed to his prayer group titled, "Jeremy Lin's Prayer Requests 7." The NBA player shared specific prayers from his "upcoming prayer list" which includes learning to give thanks and praise. Since Lin's team are not making the playoffs, he also prayed for a specific mindset that would enable him to continue playing for God's glory and surrender each game to God with humility. Lin also called for prayer for his teammates and coaches, that their tough season may help them get saved. 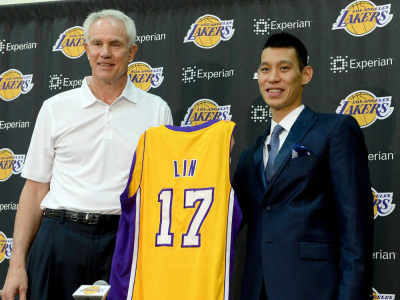 "This season has had its fair share of discouragement, disappointment and brokenness," Lin wrote. "Please pray that their vulnerability from a tough season would allow them to seek and see Christ, whether through joining chapel, Bible study, daily devotionals or a church." While Lin also praised God for a YouTube video that shed light on homelessness, he asked that people would pray that they also come to Christ and have their needs met. "Prayer that these individuals would have open hearts to truly know Jesus Christ," Lin wrote. "Also prayer that God would provide for their physical needs, whether it's for housing, a job or stability in general." He went on to pray for a worldwide spiritual revival, and admitted that he shied away from big prayers at times. "Often times, I'm afraid to pray big prayers because they seem so intangible or too unrealistic, but I have to remind myself that God is bigger than anything I will ever face or encounter and my biggest dreams are nothing compared to the power He possesses," Lin said. "So prayer for global revival!" Last year, Lin introduced the prayer group to fans which sends an email of prayers to those who subscribe on his website. "The NBA star revealed that he would begin a prayer group that fans can be involved in. "The journey I've been on has had its ups and downs and I appreciate all of your support throughout. Some of you have asked how to pray for me so I decided to start a prayer group where I can send out requests for those that want to pray and support," Lin wrote on his website. "Please feel free to share with others you think would be interested. So much of what happens is out of our control, but prayer has been a place I have consistently found peace with God."